Did you ever have to untangle your sunglasses because they were so messy like this? Well, I do! We keep our sunglasses in our laundry room slash mudroom. They were pretty much organized because they were all inside the box. But taking any sunglasses from that box is such a headache because they're all tangled up. Then hang all the sunglasses on the wire shelving and now look like this. I don't know why I've not thought about this before...lol! ♥ ♥ it! What about you guys? 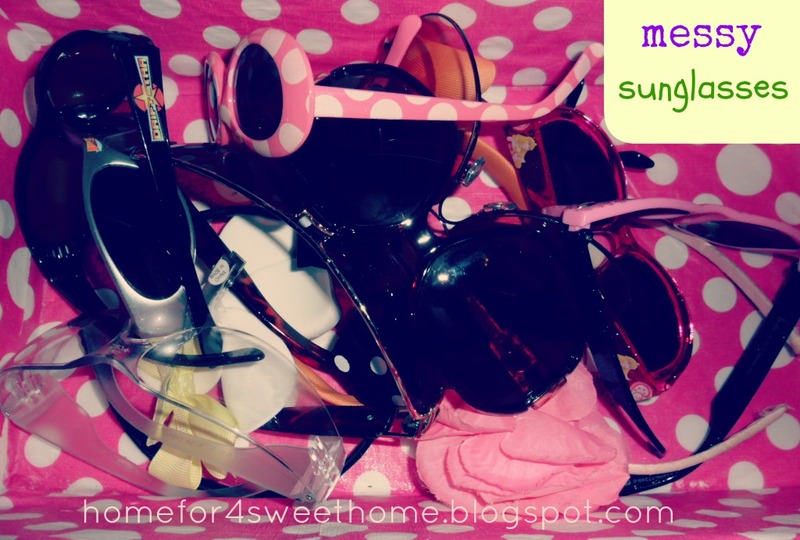 How do you organize your sunglasses? i agree with you saranda, thanks for stopping by.. I'm luck to have one pair last more than a summer due to little finger getting them, I feel this sort of organisation could work for me. I'd like to invite you to the Saturday Bloggy Takeaway to link up your blog. goodluck organizing james :) thanks for the visit! thanks rosey, i do have one on my car - these are my spares, lol! thanks for the follow april, on my way to follow you back! That's a lot of sunglasses. Are all those yours or some of your daughter? I like the pink polkadot one! yes a lot! well, these are mine, my son's and my daughter's - the Mr. only got a couple i think..and the polka dot one is my daughter's anne! Wow that's so many pairs!! I have one...that sit in their box :) we don't have much sun. Week 9: Fun Friday Blog Hop Time! Week 8: Fun Friday Blog Hop Time! Aloha Friday Blog Hop PLUS Giveaways! Are You Looking for Quality Glasses? Week 7: Fun Friday Blog Hop Time! Week 6: Fun Friday Blog Hop Time!